Protecting woodland along the Zambezi riverbank in the south of Zambia, this beautiful park is prolific in wildlife. Your best off flying into one of the camps inside, otherwise it’s a long drive in through a Game Management Area (GMA). The track through the GMA is narrow and the elephants grow on trees, at least that’s how it feels. We were stopped dead in our tracks when we spotted a herd of elephants near Chongwe Gate, the main entry point. A juvenile male came over to our 4WD, lifted a leg up and swayed around and, with its trunk, casually sniffed our windscreen and windows. My foot hovered close to the accelerator...inside the park we saw antelope such as puku and bushbuck, buffalo, zebra, plenty more elephants and lions. We even caught a fleeting glimpse of a cheetah. Boat rides down the river are a great way to spot wildlife- especially birds - with kingfishers being a real highlight. The tracks are pretty tough going though and the rainy season really messes them up - let a camp of your choosing do the heavy lifting. Sandwiched between the Zambezi River and the Great East Road, this incredible park boasts over 100km of river frontage, the imposing Zambezi escarpment, top-class wildlife-viewing and scenic beauty in abundance. With the exception of rhino, cheetah and giraffe, Lower Zambezi is home to high concentrations of all the other charismatic mega-fauna. But, over-and-above the attraction of the beguiling Zambezi strewn with hippos, crocs and frolicking elephants, it’s the wide range of safari activities on offer that really make Lower Zambezi such a unique safari destination. Adventurous safari goers can choose between game drives, night drives, walking safaris, canoe safaris, boat cruises and tiger fishing safaris. To the best of my knowledge there is no other park in Africa that offers the same diversity of safari experiences at a single location. My best Zambian safari memories involve paddling a canoe silently down the braided Zambezi in the company of large breeding herds of elephant swimming trunk-to-tail across the mile-wide river. Unforgettable experiences. Elephants languidly criss-crossing the river, buffaloes feeding in the reeds, grunting hippos cooling off in the shallows, crocodiles basking idly in the sun - I never dreamed I would be able to get as close to Africa’s amazing wildlife as I did on a canoe trip through Lower Zambezi National Park. The game viewing here is simply spectacular. The park has strong populations of buffalo and elephants, often found grazing on the islands in the middle of the river, as well as large herds of impala, kudu, eland, zebra, wildebeest, waterbuck, bushbuck and the odd duiker with the greatest concentration of wildlife found on the flood plain or along the river itself. Lion, leopard and wild dogs can also be spied, though in my experience sightings are less common. The birdlife too is very rich with some 378 species recorded, including many species of eagle, heron, stork, kingfisher and bee-eater. A self-confessed non-birder, even I was dazzled by the colourful dance of a colony of Carmine Bee eaters as they fluttered around the riverbank. With 120km of river frontage and a vast floodplain of tributaries, islands and channels all back-dropped by an impressive heavily-wooded escarpment, it’s often hard to know which to admire – the scenery or the wildlife. But then again, that’s the park’s magic. The birdwatching was superb on my visit to the Lower Zambezi National Park. Kingfishers shone on nearby reeds as we meandered along freshwater channels by canoe, and nonchalant-looking saddle-billed storks picked their way through the shallows. Large animals seemed equally unruffled by our presence – we saw elephants, zebras and buffalo, all drawn by the water as the dry season reached its peak. Apparently, visitors sometimes see leopards on the banks, too, drinking their fill, but sadly our luck didn’t quite extend to that. The environment and its wildlife are captivating, but what makes a visit to the Lower Zambezi extra special is its accommodation. Some of Zambia’s most alluring bush lodges are found here, imaginatively designed and staffed by true enthusiasts, including walking and canoeing safari guides who are experts in their field. The mile-wide Zambezi, southern Africa’s mightiest river, is the dominant feature of this spectacular park, which you can explore by canoe, on foot or on conventional 4WD game drives. The riverbanks with their ebony groves and majestic old winterthorns create a natural canopy for top-notch camps such as Chiawa and Old Mondoro, its more rustic offshoot. Fish eagles provide a constant soundtrack and there are elephants all over the place. I found the big bulls to be invariably good-natured – just as well because at Old Mondoro they wandered into camp every day of my stay. Even so, they must be treated with respect; and the same goes for any hippos encountered on a canoe safari. 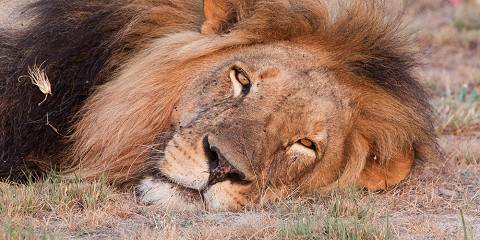 As for walking, the lofty aisles of winterthorns with their dappled shade and minimum ground cover are ideal; but to see the park’s top predators – lion, leopard and wild dog – you’ll do better on a conventional 4WD game drive. As its name suggests, this park is dominated by the mighty Zambezi which marks its southern border, cutting a swathe through vast floodplains. It attracts a mass of wildlife, particularly huge herds of elephants easily seen on the riverbanks, along with fabulous birdlife. The Zambezi escarpment forms the northern border, making for dramatic landscapes. Aside from rhino, all of the Big Five are here and as well as the usual game drives, you can do walking safaris and night drives, go canoeing or take a boat on the river, personally my favourite way to explore this park. We had an unforgettable sunset cruise from Anabezi Lodge, watching elephants, hippos and waterbucks as the sun set, then, when we turned the boat around, saw a brilliant, bright red full moon that guided us home – a truly magical experience. Many of the lodges support an excellent local NGO, Conservation Lower Zambezi, which works with local communities to help protect the park and its wildlife. Of all the parks I’ve experienced in Zambia, Lower Zambezi remains the prettiest for me, with an amazingly diverse array of ecosystems and vegetation. The great, meandering body of the Zambezi flanks the park on one side and a high escarpment presides over the river basin on the other. Both these features make great backdrops for viewing the park’s wildlife. Taking a guided canoeing trip down the Zambezi is an absolute highlight, though perhaps not for the faint-hearted. You’ll most likely never get so close to hippos, crocodiles and elephants, all of which are found in staggering numbers in this park. Lower Zambezi is also a good place for guided walks. When I did this activity sadly we didn’t see much big game, but it’s still a more intimate way to experience the natural beauty of this park. The park’s small handful of tranquil, secluded luxury lodges and camps are all situated on the banks of the river. Elephants and hippos are regular visitors. If coming by car, Lower Zambezi is not the most accessible of parks, but as with many of Zambia’s offerings that’s part of the appeal. Zambia is known for its adventurous approach to safaris, and no reserve epitomises this so clearly as Lower Zambezi, which is best explored by canoe, following the wide main river or one of the narrower and more dangerous channels that flank it. This is quite simply one of the most exciting safari experiences I’ve had in Africa, partly because of the slight but real danger posed by hippos and crocs, partly because of the sheer wonder associated with travelling along the river, past elephants, buffalo and occasionally lions, without anything between you and them bar a sheet of shallow water. Another aspect of Lower Zambezi that we loved were the night drives – fantastic leopard sightings more than once on most nights – and it is also a pretty good place to seek out the endangered African wild dog. Add to that the mesmerising presence of southern Africa’s greatest river, and the wonderful birdlife associated with the flanking riparian forest, and I’d comfortably place this among my ten favourite reserves anywhere in Africa. Lower Zambezi was once sadly neglected but has enjoyed a resurrection in recent years and now has solid numbers of elephants, hippos and buffaloes, as well as a healthy big cat population, with lions and hyenas commonly seen. 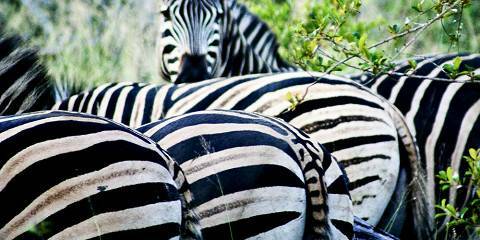 Also on the agenda for most visitors are impala, kudu, zebra and wildebeest. 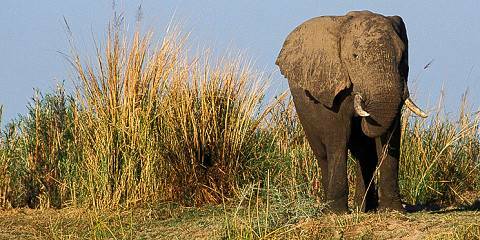 The best way to see wildlife here is by gliding along the Zambezi by boat or canoe. The river is packed with crocodiles and hippos, and skirts alongside a beautiful flood plain, sprinkled with acacias and framed by thick woodland. 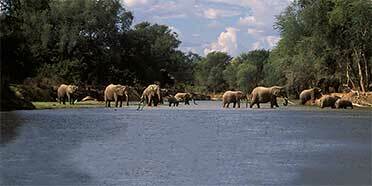 For me, the best part of visiting Lower Zambezi was a water-based safari. I watched buffalo and waterbuck feeding in the marshy grasses along the shoreline, heard pods of hippo grunting just beneath the surface, and saw a group of elephants swim leisurely across the river. This park sits directly opposite Zimbabwe’s Mana Pools, and offers a mirror image of that park – with very similar wildlife and terrain, but with the escarpment looming much closer. Indeed during the dry season, with the river at its lowest, I have often seen wildlife crossing between the two parks. The last two decades have seen game numbers returning to impressive levels after a bad history of poaching. All lodges are sited on the riverbank – with a good number outside the park and a few, more exclusive establishments inside. The latter tend to offer better wildlife, although game is everywhere. Activities centre around the Zambezi, with boat cruises, fishing and canoeing; I have found myself negotiating a narrow channel by canoe with elephants crossing in front, hippos to the left and a five-metre crocodile cruising past on the right. But the game drives away from the river are equally rewarding – and the guided walks are on par with those in South Luangwa. As at Mana Pools, you will find game wandering through camp and large elephant bulls a constant presence at many lodges. Species you will not see include cheetah, rhino and giraffe, but predators are abundant and I have always been lucky with both lion and leopard. Birders can expect the usual riches associated with the Zambezi. Lower Zambezi is not about how much wildlife you spot or how many birds you can tick, it is about the canoeing experience. Gliding on the Zambezi without the noise of an engine with just the chirping of birds, maybe the occasional call of a fish eagle and of course the snorting of hippos, is magical. Leaving the main river for the channels makes for a more intimate river experience. You feel closer to nature and I felt especially closer to the hundreds of hippos that live here and that keep on popping up unexpectedly from under the water. Our brilliant guide kept on telling us to keep to the shallows…but where are these shallows? I certainly couldn’t tell. From your canoe, you obviously won’t see as much as on a normal safari, but anything you do see is very special. I remember gliding past some young lions on the shore, watching us with curious interest. Another highlight was when we had to hold on to some branches on the side to stop the current pulling us forward into a herd of elephants crossing the river in front of us. I loved the sense of a journey created by canoeing from camp to camp over several days, but if that is more of a canoeing experience than you would like to sign up for, you can combine the more classic driving safari with some small river trips.